If you want to travel on the Bangkok to Kanchanaburi train, there are two daily scheduled departures from Thon Buri Railway Station (also known as Bangkok Noi), located on the western side of the Chaopraya River. 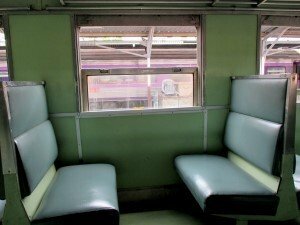 The distance from Bangkok to Kanchanaburi by train is 116 km and the scheduled duration of the journey by train is around two and a half hours (but don't expect these services to run on time that often). These trains continue on to the River Kwai Bridge Railway Station, then on to the end of the line at Nam Tok. Don't put in Bangkok, as you will get no results as these are for trains from Hua Lamphong Station. Another popular way to get to Kanchanaburi is to take a minivan / minibus from the Southern Bus Terminal. Or to travel from Khao San Road to Kanchanaburi, there are a couple of companies that offer bus and minivan connections. These rather, slow and old trains, operate with 3rd class, fan cooled, open window carriages only and can come in many different types - some with cushioned seats in rows or along the edges of the coach, and some with hard wooden seats. Although the published fare for these trains to Kanchanaburi from Bangkok is only 25 Baht, tourists are charged 100 Baht per ticket along this line, for whatever route you travel. So you will pay 100 Baht from Thon Buri to any station - Kanchanaburi, River Kwai or Nam Tok. As these are Ordinary services, tickets are only sold on the day of travel from Thon Buri Station ticket counter. Don't worry about the train being full, there will usually be no problem getting a seat, and if there is, there will always be room for standing passengers. Want to find the best places to stay in Kanchanaburi?